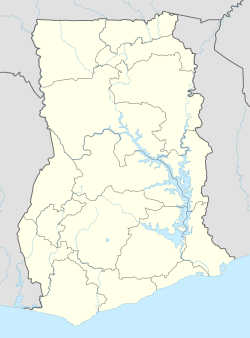 Bolgatanga, colloquially known as Bolga, is a town and the capital of the Bolgatanga Municipal District and Upper East Region of Ghana. Bolgatanga has over 2012 settlement and a population of about 66,685 people. Bolgatanga is 161 km (about 100 miles) to the north of Tamale. Bolgatanga lies in the Red Volta River Valley (which serves as a major migration route of elephants), with the White Volta River and the cliffs of the Gambaga Escarpment to the south of the town forming the southern boundary of the Upper East region. First-top picture: Avenue Landscape and Hotel in Bolgatanga • First-bottom picture: Highway in Bolgatanga • Second-bottom picture: Restaurant in Bolgatanga. Historically Bolgatanga was situated at the southern terminus of the ancient Trans-Saharan trade route. The eastern route converged with the Sahelian route, near Bolgatanga. Along the route, handicrafts—especially straw baskets, hats and fans, as well as leather goods, metal jewellery, and indigenous attires — were exchanged for kola nuts and salt. The Upper East Region, where Bolgatanga lies, is part of what used to be known as the Upper Region. Between 1902 and 1960 the Northern Territory was a British protectorate; it was separated into the Northern and Upper Region on July 1, 1960. The Upper Region was apportioned into Upper East and Upper west region in 1983. Bolgatanga is known as the crafts centre of Upper East region, with a large central market. Apart from items found elsewhere in Upper East region, the so-called "Bolga hats" are made and sold in Bolgatanga. Bolgatanga and its surrounding suburbs also comprise the largest producers of leather works, straw baskets and smocks. The artists sell their works at the Bolgatanga Market, which is open every third day. There is also a museum in the town which houses objects of historical importance of the Upper East region. Bolgatanga has a hot semi-arid climate (Köppen climate classification BSh). Farming is the Main occupation of the people of Bolga. They engage in subsistence farming of millet, maize, guinea-corn, rice, beans, groundnuts and sweet potatoes during the raining season and irrigation farming of onions, tomatoes, and pepper during the dry season. almost every farmer rears at least a bird or animal. The Tongo Hills is located, 17 kilometers (about 10 miles) southeast of Bolgatanga. With its landscape dominated by large granite formations. The "tomb" of, Naa Gbewaa, the founder of the mole Dagbani, is located in Pusiga in the upper east region of Ghana. Legend states that Naa Gbewaa never died but simply vanished during a heated battle. The shrine was thought to have been built in the 14th century in commemoration of Naa Gbewaa, and is today a place of spiritual reverence. The Bolgatanga library is a notable design of award-winning American architect J. Max Bond, Jr., who was influenced by Le Corbusier. Bond lived in Ghana for four years in the 1960s, escaping racism in the United States. The Bolgatanga library was his first major project while working for the national construction company. The design features perforated walls and an "umbrella" shaped roof, so the structure remains cool and well ventilated. Forty kilometres (about 25 miles) from Bolgatanga, is Paga, home to the sacred crocodile ponds. These are purportedly the "friendliest" crocodiles in Ghana, and it is said that the souls of the royal family reside in them. The crocodiles roam freely throughout the ponds and it is unthinkable that anyone should harm them. ^ "Traffic Rescue". Traffic Rescue. Retrieved 2014-04-18. ^ "Ghana » Upper East Region » Bolgatanga Municipal". Bolga.ghanadistricts.gov.gh. 2014-03-12. Archived from the original on 2014-04-19. Retrieved 2014-04-18. ^ a b c d e f g h "Upper East Region Attractions - Ghana Tourism Homepage". Touringghana.com. Archived from the original on 2014-03-17. Retrieved 2014-04-18. ^ "Bolgatanga Weather Averages". Meoweather. 2013. Retrieved 21 June 2013. Culture and tourism: Upper East in focus.